The notorious bandit Otto Wood (1895-1930) became something of a folk hero in the North Carolina mountains in the late 1920s when, following a conviction for killing a Jewish pawnbroker, he succeeded in escaping from prison no fewer than three times, thus earning the sobriquet, "The Houdini of Cell Block A." A Depression desperado, Wood was finally killed in a shootout on the streets of Salisbury, North Carolina in December, 1930, shortly after his final prison escape. Despite an obligatory author's foreword expressing a wish that his story might "...help some fallen mortal to a higher life," Wood's narrative is refreshingly unrepentant, detailing a lifelong career of petty crime, vagabondage, moonshining, gambling, whoring and periodic incarceration. The twelve-page afterword to this edition, written anonymously, recounts the events that followed Wood's final escape, concluding with the Salisbury shoot-out. Wood's exploits were immortalized in Walter “Kid” Smith's 1931 ballad Otto Wood The Bandit, which ended each verse with the refrain: "...Otto, why didn't you run / when the sheriff pulled out that .44 gun?" The ballad was re-recorded in the 1960s by Doc and Merle Watson, and has since become a folk-music standard. I can't tell you all, but I wish I could. And with the clerk he had a quarrel, they say. And this is the way the story goes. he sheriff served a warrant on Otto Wood. And the judge passed the sentence to the peniteniary. CHORUS: Otto, why didn't you run? Otto's done dead and gone. When the sheriff pulled out his 44 gun? It wouldn't hold the man they call Otto Wood. Drawed a gun on the guard, said, "Take me for a ride." In the holdup game, he got shot through the breast. They locked him down in a dungeon cell. He always carried a 44 gun. He met the sheriff in a southern town. 'Cause I've been expecting you every day." "If you make a crooked move, you both fall dead. Crank up your car and take me out of town,"
And a few minutes later, he was graveyard bound. This is an exceedingly rare book in any edition. OCLC notes four copies in library holdings worldwide, recording a 1926 edition of forty-three pages and a 1931 edition of twenty-two pages. However, the present edition, with added matter and an afterword, is, apparently, unrecorded by any OCLC member institution. Above, The Carolina Buddies (Walter "Kid" Smith and friends) perform Otto Wood, the Bandit, recorded in NYC, NY on February 4, 1931. WOOD, Otto. 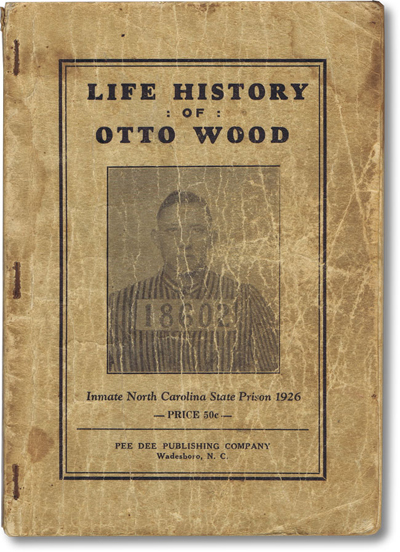 Life History of Otto Wood. Inmate North Carolina State Prison 1926. Wadesboro, NC: Pee Dee Publishing Company, 1931. Posthumous (second?) edition, complete, of a virtually unobtainable Southern outlaw narrative. Significantly expanded with photo-illustrations and a twelve page afterword. Twelvemo (19.5 cm). 62 pp, three leaves of half-tone photo-illustrations. Staple-bound pamphlet with original photo-illustrated wrappers. Thornton, A Bibliography of North Carolina 1589-1956, 15354. Not in Suvak, Memoirs of American Prisons: An Annotated Bibliography.